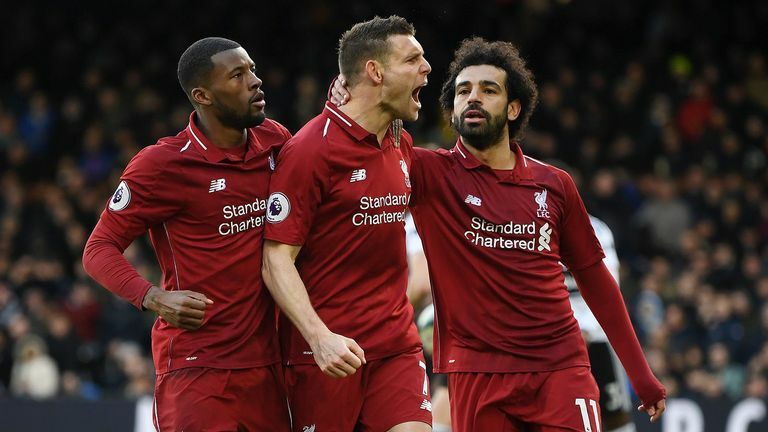 Sadio Mane was on target again as Liverpool moved back to the top of the Premier League with a 2-1 win at Fulham on Super Sunday. As Mohamed Salah's form has dipped, Mane has stepped up for Liverpool when it mattered most, writes Adam Bate. Mane produced another piece of brilliance for Liverpool's opening goal against Fulham. "I love what he does," Jamie Redknapp told Sky Sports. "He is not just content to pass the ball and stand still, he wants to pass it and get into the box with a bit of pace. "That's just a man who is red hot right now." It was the timing of Mane's run that was the key factor in that goal but it's the timing of the forward's run of form that has been absolutely crucial to maintaining Liverpool's title push. They are back at the top of the Premier League and that could not have happened without him. Mohamed Salah's goals had propelled Jurgen Klopp's team to another level for much of the past 18 months. Unfortunately, the Egyptian has endured a dip in form and has now gone seven games without a goal - by far the worst sequence of his Liverpool career. It appears to be affecting Salah's decision-making now, but it has not affected his team too badly - and that is down to Mane. He has seven goals in his last five games, 11 in his last 11. He now has 20 goals in all competitions and this is the best league return of his career too. "This is not just the form man in the Premier League, this is the form man in Europe," said Jamie Carragher on co-commentary for Sky Sports and the numbers back that up. He has nine Premier League goals in 2019, which is a tally that only Sergio Aguero can match. "That's no penalties as well," added Carragher. "If you think of the top scorers in this league, Salah, Harry Kane and Aguero are taking penalties and he's right up there alongside them." Indeed, strip out the penalty goals by those other players and Mane has now outscored every other player in the Premier League this season. Why is he scoring more now? It is tempting to think that the opportunities are now falling to Mane instead of Salah and some of Klopp's recent comments seem to suggest that it is just one of those things. "With goalscoring, always a little bit of luck is involved and if you have it in a moment like this then you have to use it because there will be other moments in life," said the Liverpool manager. "He always had the quality. He's just in a good moment of his career." Some of the numbers support this argument. Mane has got himself into good positions but he has still scored more goals than might have been expected from the chances that he has had. According to Opta, Mane has had 18 clear-cut chances to score in the Premier League this season, which is fewer than the other top scorers in the competition. In fact, it's the same number as Manchester City's Gabriel Jesus but Mane has converted 11 of his opportunities and Jesus only four. But Mane's increased output also reflects his growing maturity. He turns 27 next month and his first goal against Bayern Munich on Wednesday was that of a man who appears ready to seize the moment. He has a manager who believes in him and supporters who adore him. "Sadio is coming to an age where things are becoming more natural for him," said Klopp. "He is not in the part where he has to convince everybody every day of his career, that he has a good one. We all know he is a world-class player and now he starts realising that himself." Klopp added: "Mixed up with his attitude and his work-rate, it could be a really decent career, even better than it has been so far." The prospect of Mane making further progress is an exciting one for Liverpool supporters. But the truth is that they need him at his best right now. It's Tottenham next up at Anfield and if Liverpool can negotiate that then belief will only grow that they can keep up the pressure on Manchester City right to the end. After that, there's the trip to Mane's former club Southampton. In truth, every single game matters. Liverpool cannot do it without Salah ending his goal drought, most supporters will accept that. But they have a chance thanks to the efforts of Mane. "What a signing he has been for Liverpool," said Carragher. And what an iconic signing he could yet go on to become.